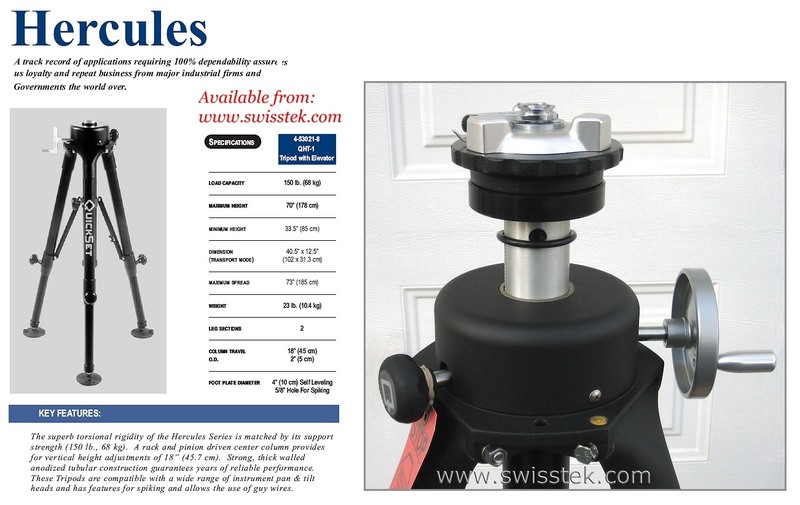 Hercules standard tooling stand with rack and pinion center column crank and #193-358 adapter head Lightweight yet rigid enough for most portable tooling stand applications. Gibraltar heavy duty tooling stand with rack and pinion center column crank and #196-5811C adapter head with circular bubble. Shown with a Kern E2-EC autocollimating theodolite. Kern-Leica 1916 universal centering tripod with self-locking bayonet head and plumbing rod. Allows for very fast and precise set up. Much sought-after Kern reflector Bi-pod. Its unsurpassed quality is legendary. 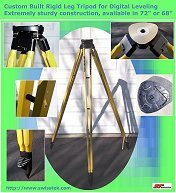 Swisstek universal rigid leg Supertripod, available in four models: 68" and 72" inches in height, with fixed center head or slide head. Kern heavy-duty aluminum cast bayonet lock adapter plate #196 with 5/8 x 11 brass insert or 3x mounting holes for installation. Exceptionally rigid and used with tooling stands or pillars. 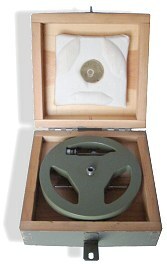 Large pads accepts all Kern forced centering instruments. Kern standard centering adapter #193-1214. 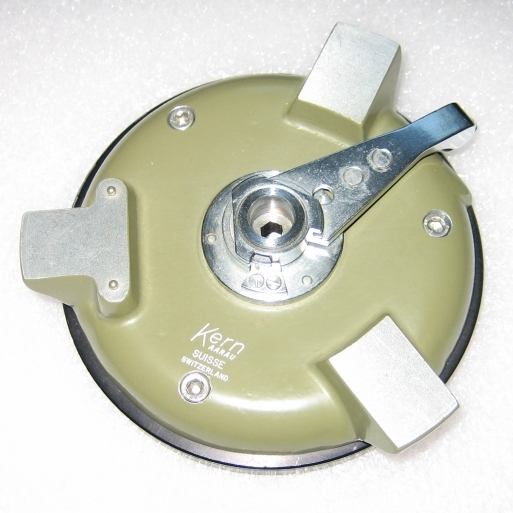 With a diameter of 105mm it lends itself for all Kern bayonet lock applications and is suited to the E2/E1, DKM2-A, K1-S and K1-M theodolites. Screws onto any 3-1/2x8 tooling fixture and Hercules or Gibraltar tooling stand, etc. 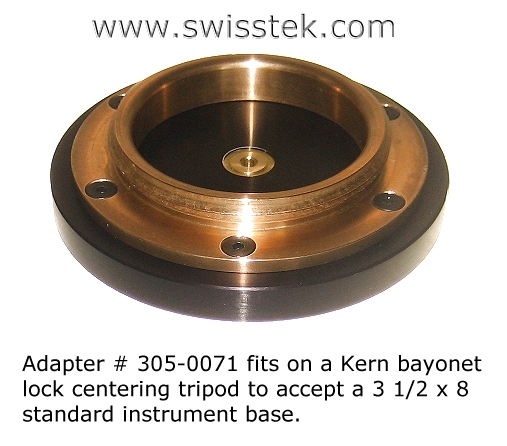 Kern forced centering adapter #196-5811. Large diameter of 158mm for heavy loads. Screws onto any 5/8x11 tooling fixture, Hercules and Gibraltar tooling stands, etc. 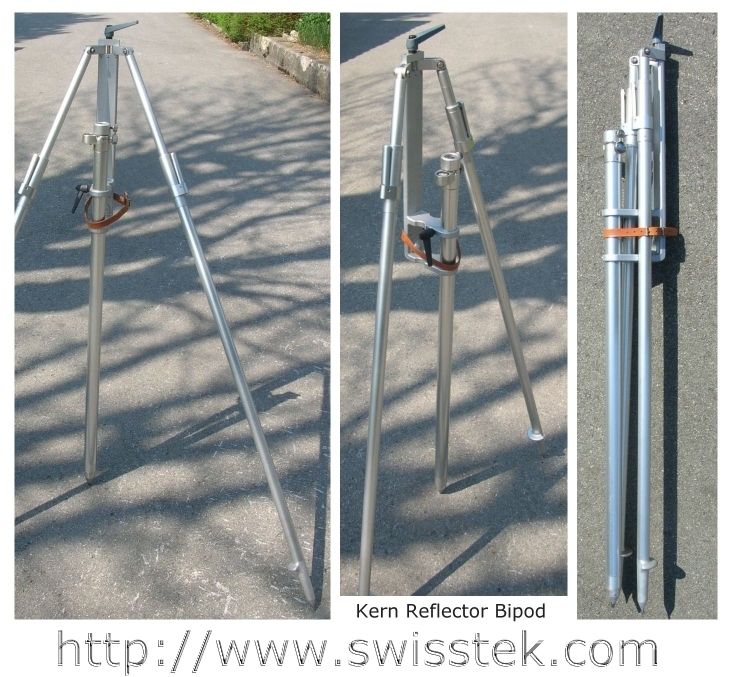 Ideally suited for the Kern DKM3 or E2 theodolite series. Tripod forced centering adapter #5811. Locks onto Kern tripod bayonet head to be used with all 5/8x11 tribrach Theodolites, Total Stations and Robotics. Allows for extreme quick leveling and exact set up over a point. 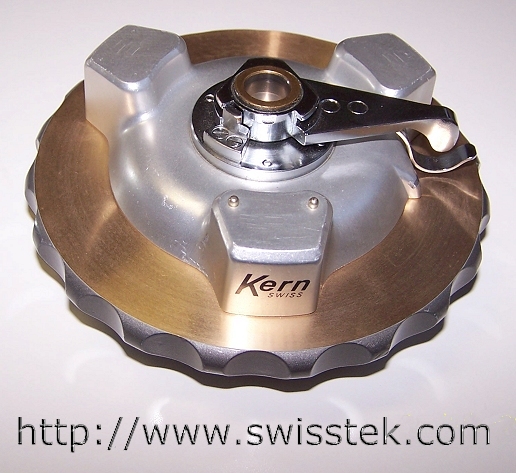 Kern standard forced centering adapter #193-358 attached to a fixed #198 Brunson trivet. Mounting pad height is 7". Comes with removable stainless steel points. Kern swivel head forced centering trivet with circular bubble and lock lever. For exact set ups with centering pin over a known co-ordinate. Sits on fixed hardened carbon steel points. 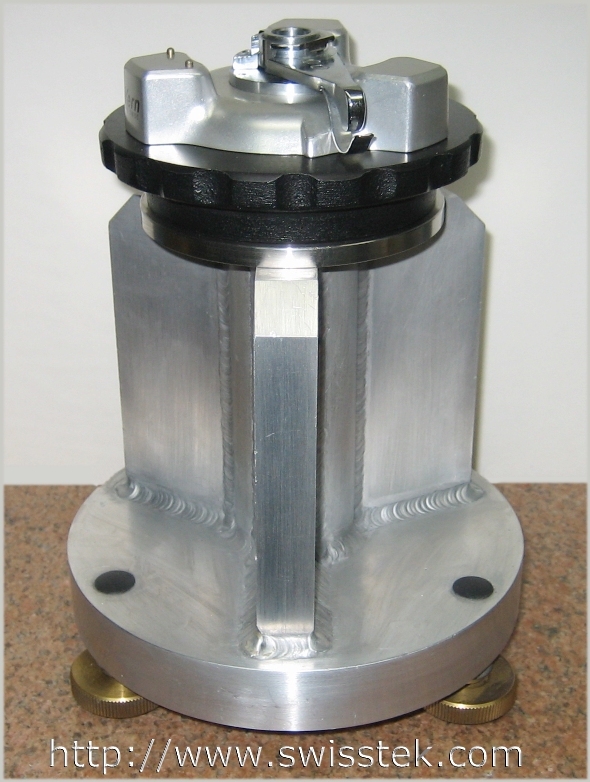 Kern standard forced centering adapter #193-358 attached to a rigid and adjustable trivet aluminum tower. Precision leveling screws with swivel pads have a traveling range of 1/2". Mounting pad height at low end is 9". Adapter #305-0071 fits to any Kern forced centering tripods or #196 or 193 forced centering bayonet lock head and mates with a 3 1/2 x 8 standard instrument thread. 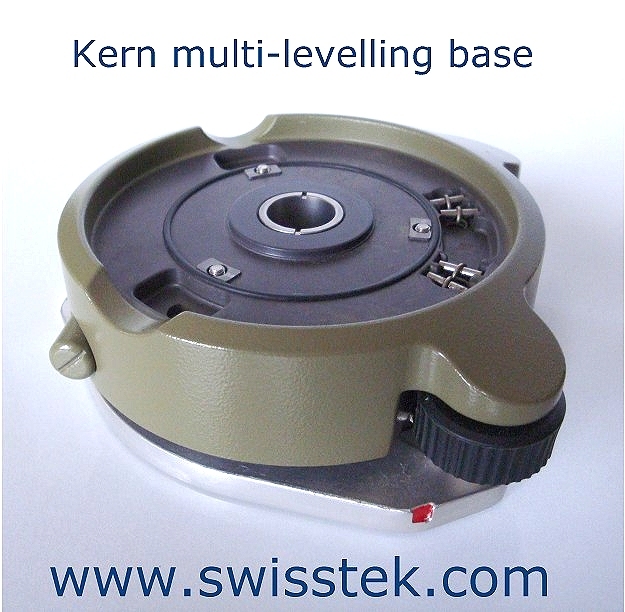 Kern multi-leveling base module. This leveling flat is used where the 220mm standard axis height needs to be maintained. Will fit the new-style Kern theodolites in place of Swiss-style tribrach. Tribrach with Wild GDF21K Kern tripod base for use with a Kern centering tripod like the W173 or W174 etc. Converts a tribrach instrument to a Kern centering base. 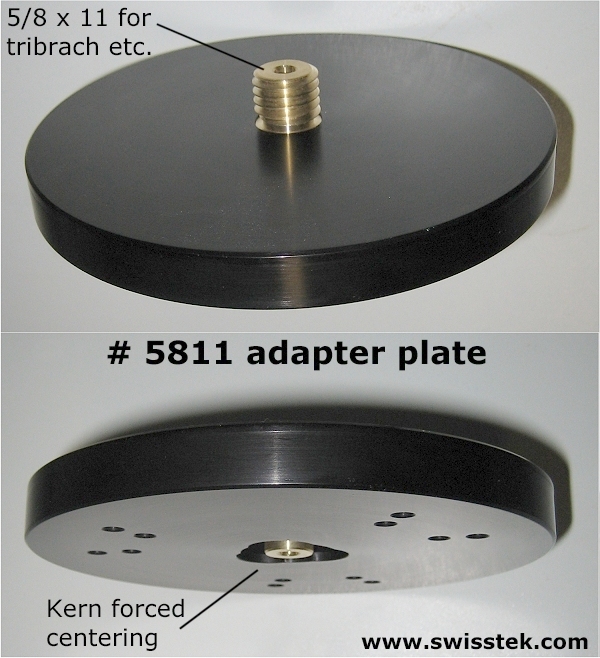 Adapter # 6003 converts a Kern- base instrument to a tribrach base. 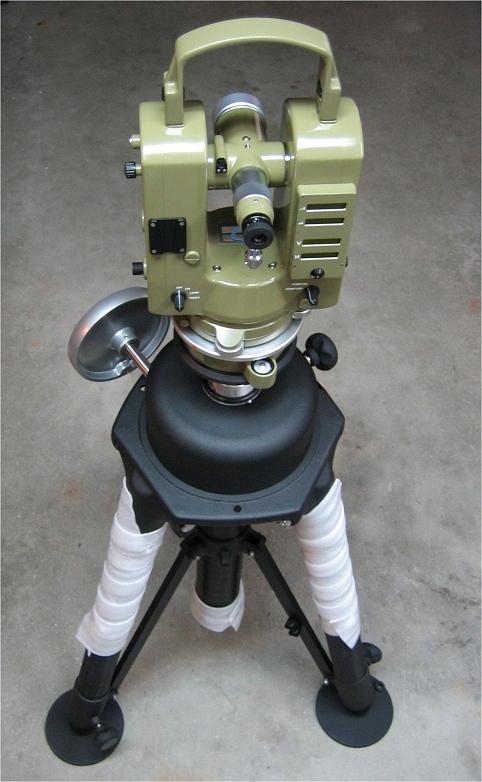 An ingenious conversion to adapt a Kern centering base theodolite to a tribrach. Can be used with most Kern theodolites or levels, like the DKM2, DKM1, DKM2-A, K1-S, K1-M or GK0-A, GK1-A etc. Kern bayonet lock adapter to fit into a universal tribrach. pin. Will accept any 5/8 x 11 instr.